My name is Cameron Tindall. Welcome to my résumé site. I am a curious, outgoing IT professional in Austin, Texas. If you're considering me for a position, this page is here to help you make that decision, but that doesn't mean I don't want to talk! Please feel free to drop me a call or line by visting the contact section. While I am very happy in my current position as Lead Incident Manager at the Endurance International Group (and they are happy with me! see this letter of recommendation from my current manager), I am attending school in the evenings and seeking other opportunities in order to break into software development, my real passion. I have been a hobbyist programmer for approaching a decade, and would like to deepen my skillset and put it to use professionally. To that end, I am seeking entry-level positions or internships where I can put my skills to use and learn from those more experienced in the art and science of software development and engineering. Succesful in implementing new standards with existing stakeholders. Studying history as part of a well-rounded undergraduate education, I was able to sample widely from the coursework available at MSU. I specialized in European History, and was granted special permission to take some graduate-level courses relevant to my research interests, which included the development of print and the history of science. In addition to academic pursuits, I was active in a number of organizations including the International Relations Organization, Model United Nations, and my housing cooperative Montie House. monitoring system health via Zabbix, Icinga, and in-house monitoring tools. This was a fast paced environment where it was frequently necessary to understand new technologies quickly and to work under time pressure. During my time in this role, I rarely missed very strict performance metric goals, and received the “Employee of the Month” honor. I worked as an ESL (English as a second language) teacher in a number of settings including private tutoring students, daycare and after-school programs, and University courses, both in the United States and abroad in Kraków, Poland. This experience improved my fluency with public speaking, including my skill in changing my register to new audiences as appropriate to them. I designed lesson plans, activities, and field trips to supplement ordinary classroom-based instruction. As part of the Federally-funded 21st Century Program, I coordinated a slate of educational after-school activities for middle-school aged children at Willie E. Thompson Middle School. Activities included structured debate, creative writing, problem-solving, and team-building activities. I was also responsble for a number of reports necessary to maintain grant funding for the program. As a substitute teacher employed by a firm serving multiple districts in the Mid-Michigan Area, I was called upon to teach at every level from Kindergarten to High School on short notice. I taught all subjects, from basic reading to high-school math. I was frequently sought-out specifically by several teachers and principals who were very happy with my work, and more than once engaged for week-long stints in the same classroom, fleshing out lesson plans with my own activities. A web application and static site generator that generates websites from org-mode input files. Tools to aid LAMP system administration. Small utility to generate UNIX-style tab-separated output files from standard RSS feeds, allowing the easy construction of shell pipelines and scripts that consume these feeds. full usage, README, and documentation included. Jekyll template and Makefile for generating a professional-looking resume site from structured input. produces static HTML site and PDF from identical input sources. 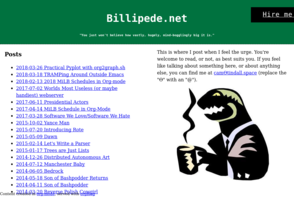 My technical blog where I write more or less regularly about projects, scripts, and other interests. 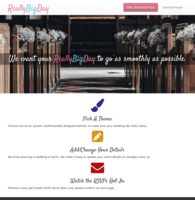 Business offering custom websites for couples planning weddings. 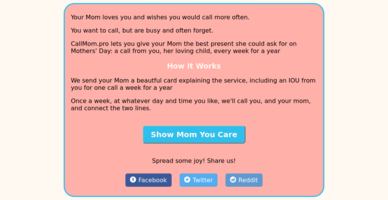 Service that will automatically connect you with your loved ones, so you never forget to stay in touch! 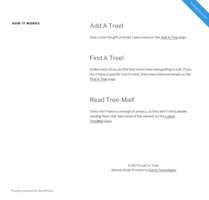 Fun site allowing users to send messages to beloved trees in their area. Simple web application in HTML/jQuery to help plan a weekly brownbag lunch schedule.